I will not let the sacred be destroyed. My body, mind, and soul shall stand against that tries. Description: Most of his family are tall and dexterous and Briar is no different. Long of leg and limb with a lean strength in his young body. Long pale golden hair falls down his back and he has a darker golden goatee that is often rather rough and overgrown. Broad shoulders are strong from a youth spent hauling wood and other hefty chores. He has a rugged handsome look, but is still growing fully into his tall body. Personality: As a child he was called 'wild child'. That wild has transformed into a fierce sense of loyalty and duty. That applies to his vocation just as well as the rest of his life. But he is also fierce in everything. In his joy, in his anger, in his pain. Though he may wish, it is a struggle for him to leash his enthusiasm and seemingly endless energy. 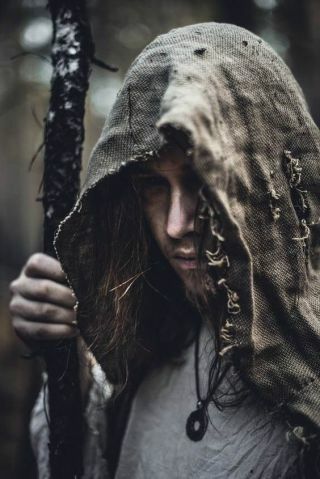 Background: Born into a Halfshav village, Briar was the third youngest son of a full family of woodcrafters. A mother, a father, and three brothers, and a sister, Violet, the family did well living off the land and selling to the leatherworkers. He got to spend his days following his older sister around the woods, her eternal shadow. That would occasionally wander where the dappled sunlight or shadows seemed to guide him. A true child of the forest he could approach a deer with surprising ease. There would be the occasional skirmish with the Abandoned, but for most of his young life it wasn't a real threat. Eventually though, it wasn't enough. A warband from the village had gotten tired of the constant warfare, and attacked the small village outright. Only Violet dragging him out of bed before dawn and into the surrounding forests allowed them to survive the massacre of their family and most everything and everyone they had known..
By the time the Halfshav army arrived it was too late to do anything but help the survivors. Briar and Violet didn't leave with the others, however, and stayed to take out the warband once and for all. The Halfshav army had hired a nearby company of Crimson Blades to assist them in the eradication of this particular Abandoned problem. When the dust settled the survivors of the village were scattered and Violet and he had no home or family to go too. Yet his sister's talent with a bow had caught the Colonel of the Blade company's attention. Soon they were off to Arx with the Blades and a new life. Briar, who had always had a calling for shamanism finally had the ability to do something with it. Being a woodcrafter was all well and good, but he felt his passion lay with the spirits. So with his sisters blessing and support, he joined the Spirit Walkers. It was been a few years now and he has grown well into his vocation, his fierce energy doing him well in some areas and less in others. Agatha Violet's tall little brother seems like a good kid, even if she does worry about him wandering off to talk to the Spirits. I think he could become everyone's little brother really fast. Aiden The man is very confident in what he's doing, I can hardly help him improve much more with his relationship with his animal companion Khan. He has natural instincts as a leader to be able to train the dog so thoroughly as he has. I am impressed. I shall look forward to working with in the future and observing his continued success. Caith A very friendly fellow! I visited his shop and he invited me to share his brandy with him. He's going to make me a pair of adventuring pants. With POCKETS!! Calista Tall and far more affable than I would have assumed him to be. I look forward to learning more about this talented smith. Cybele Briar Marjawn is a leatherworker and spirit-speaker and now will also be a healer. If I had worked leathers rather than study the herbs and concoctions, perhaps I would have been a Briar instead of a Cybele. Echo The Marjwan family is so near and dear to my heart. I've not gotten the opportunity to hang out with Briar all too much, but I know he's cut from some of the best kinda' cloth. Gareth A tanner with a unique name for his shop. He seems pretty earnest to satisfy his customers, regardless of what else may be hiding in that mind of his. Genevieve Haven't figured him out yet, but then I didn't spend much time with him. Seems mysterious. Violet's brother, though, so he's probably a decent sort. Jeffeth Violet's big little brother. Seems fiery, something I can respect. Petal A shaman and leather worker, who seems very nice. Prisila Reserved but outgoing, kind yet pragmatic, sweet yet definitely not soft. A youth after my own heart. I like this one. Reese He is a shaman and leatherworker. Seems like a thoughtful man. Violet My brother has returned to Arx after his last bit of training. It is good to see him again and...he grew again. I really am the short one. He hasn't changed much and we shall see if that is good or bad.